Most trains on this branch either start off at Paignton or Barnstaple, except for early and late ones which start at Exeter St Davids. The one I get has come from Barnstaple. I get on the train at Exeter Central, which is still a large station with Victorian canopies covering its two main platforms. There is a third bay platform to the south. The train will have left the Great Western main line just after Exeter St Davids station, where it curves to the south east and starts a steep climb up towards Exeter Central. It is double track as far as Exmouth junction where it leaves the main line to Waterloo. Quite a few passengers get off the train and even more get one, so it is about three quarters full. Soon after the station we pass the remains of some sidings on the left before we go into a wide cutting, which is four tracks wide. We then come into St James Park, which is also in a cutting and has very basic shelters on its two platforms. You can see the stands of Exeter City's football ground high above you on the right. Continuing along the cutting we enter Blackboy Tunnel, which is quite long, before emerging into a lower cutting. There are even more overgrown sidings on the right, which is the site of Exmouth Junction depot. The line continues onto Salisbury, whilst we turn right at Exmouth Junction signal box and start going in a south westerly direction. We are now on single track all the way to Exmouth, apart from a passing loop at Topsham. We pass new housing on the right and older housing on the left as we move onto an embankment and start to go downhill. 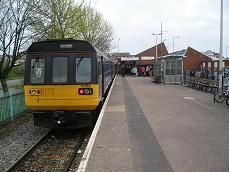 We soon stop at Polsloe Bridge station, which has just a single platform with a shelter, though the remains of a second platform can be seen on the left hand side. We are high above the houses on both sides, most of them looking like they were built in the 1960's and 70's, as well as a park on the right. We enter another cutting and then see a large modern office building on the left, followed by several industrial units. On the right is a large newly built housing estate and then we come to a stop at Digby & Sowton station. This is a new station, built in 1994 to cater for the workers and commuters who work in this IT section of Exeter. As we leave, we go over the A376 and then pass the Sandy Park Rugby ground on the left. We briefly go into a cutting before we go over the M5 motorway and into countryside for the first time. It is now unwelded rail for a couple of miles and then we slow as houses appear on both sides. We then come into Topsham station, where there is double track once more. There is already another train waiting on the other track and this starts to move soon after we arrive. On the left hand platform there is a large stainless steel framed shelter, with a boat filled with flowers next to it. On the opposite side is a large cream coloured station building. This is now the headquarters of the Devon County Association for the Blind. There is also another aluminium framed shelter on this platform. The actual platforms look like they have been updated in recent years. The train then goes back onto a single track and then into a cutting and then out onto an embankment. We pass marshland and a few small lakes as we cross over a small tributary flowing into the estuary of the river Exe, which we can now see on the right. An embankment looms on the left, followed by detached houses with plenty of daffodils and some palm trees in their gardens as we stop at Exton station. It has a dark blue painted glass shelter and a large cream coloured house right next to the platform, which is separated by a fence. On the other side the mudflats of the river Exe can be seen, with many Avocets wading on them, hence the name of the line. We go over more marshland and running parallel to the railway on the left is a newly constructed wooden walkway, which takes walkers over the marshy ground. We then see the Army base of Lympstone Commando appear on the left, complete with barb wire fence surrounding it. The train stops here and there is a single male passenger waiting on the platform. He doesn't get on the train, but greets someone alighting here. Non-army personnel are not allowed to get off the train here. In fact there are signs which say, "Persons Who Alight Here Must Have Business with The Camp" beneath the station signs. We move away only reaching 30 mph, passing fields on the left and the sea right next to the track on the right. The wooden walkway is not quite finished here and disappears as we go into a short cutting. We then arrive at Lympstone Village station, which is high above the village on the right. It has a large blue framed glass shelter and flowers in baskets on its single platform. We leave on the embankment, before going into a cutting and then emerge to see the estuary once again, with the town of Exmouth in the distance on the right. The train speeds up to 50 mph, the fastest it goes on this branch. You can see right across the estuary here to places like Starcross and Cockwood Harbour, but no trains can be seen today. We then pass houses and a football ground on the left and start to slow. On the right is a large boatyard and then a large car park. We then come to a stop at Exmouth station, which has just the one platform and two perspex shelters. Outside it is joined to the town's bus station and the town centre is across the road from the two. Summary: A busy branch line carrying many local passengers as well as holiday makers in the summer months.